Lauren Rainbow is a medium with well over a decade of experience communicating with the other side. She has spent years developing her gift along side some well know mediums, and has studied internationally. She has been a regular guest on several several radio stations around New Hampshire. Lauren had also appeared on many stages around New England delivering healing messages from the other side. 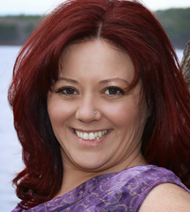 Voted the best psychic/medium in NH by New Hampshire Magazine, Lauren brings the energy of joy and heart-centeredness to her work. She considers it a great blessing to open the hearts of those in grief and empower them to find complete joy in their lives. Along with being a medium for the spirit world, Lauren has also studied many alternative healing modalities including Master Teacher training in Usui, Shamballa and Karuna Reiki and Magnified Healing (r). She is also and advanced healing therapist in Integrated Energy Therapy, Alchemical and Shamanic Healing. Lauren has appeared on FOX News, has been featured and an Up and Coming in New Hampshire’s Union Leader and has been a guest speaker on Hay House Radio. Currently she appears regularly on NH’s WLNH, WZID and WKNE. In her home state of NH, Lauren has just created her own spiritual development space, the Centered Heart Studio. She is excited to also become one of the newest faculty members of Internationally acclaimed Omega Spiritual Learning Center in Rhinebeck NY. She has produced two best selling meditation albums, Connect with Your Guides and The Centered Heart which are available for download on her website, ITunes and Amazon.